Mike: Humans are made to live in the physiological efficient zone – from sea level up to 10,000 feet. Flying high in an airliner, you’re sitting in cabin pressure of about 8,000 feet altitude. Without pressurization, at high altitudes hypoxia, decompression sickness, and trapped gases could occur, so a pilot needs to understand physiological hazards associated with that environment, how to mitigate those hazards and deal with them if they happen. To be pilot-in-command of an aircraft capable of operating above 25,000 feet the pilot must receive and log additional high altitude training, both in classroom and flight (either simulator or aircraft). The ground portion of training covers high altitude aerodynamics, meteorology, the symptoms and effects high altitude sickness, duration of consciousness without oxygen, effects of prolonged use of supplemental oxygen, and other physiological aspects of high altitude flight. Additionally, most pilots also receive training in an altitude chamber, a sealed vessel capable of simulating altitudes much higher than 25,000 feet. Experience is the best teacher and NASA’s altitude chamber exercise gives the pilot a thorough understanding of the effects of altitude on the body, and to be able to recognize one’s own reaction and symptoms of hypoxia by experiencing hypoxia in a controlled environment. Linda: My chamber partners were two U.S. Customs and Border Protection pilots/officers. Two NASA trainers joined us inside the chamber. A doctor and three more NASA operatives were outside the chamber along with two observers from the FAA. The “climb” to Fight Level 250 (25,000 feet) took about 30 minutes. Then the plan was for the Customs guys and me to remove our oxygen masks for a maximum of five minutes. We were to solve math problems and answer other questions during the time our masks were off. I answered the math questions okay in the first minute, signed my name in the three blanks and listed the last five U.S. presidents. During specific time intervals I wrote down my hypoxia symptoms: "Slightly dizzy" began pretty much right away. I wrote "dizzy" after about a minute and a half or so, "dizzier" around two to two-and-a-half minutes, and "rapid heart rate" at about the three minute mark. Before re-donning the mask one of the FAA observers said my fingernails were so blue it looked like I had on nail polish. I hadn’t even noticed. The mask caused some claustrophobia issues for one chamber mate but he completed the exercise anyway, putting the mask back on after about three minutes. The other made it the full five minutes. Many variables affect a person’s stamina for reduced altitude pressure at any given time. Rest, nutrition, fitness, smoking and alcohol, and overall general health are contributing factors. My ears didn’t handle the 5,000-foot-per-minute decent well. The valsalva maneuver – pinching my nose and blowing out while swallowing – was unsuccessful for me. I was unable to equalize my ears, so we descended at a slower rate. My Eustachian tubes may be small or scarred from many childhood ear infections. The NASA doctor checked my ears afterward reporting no blood or fluids, but my right ear didn’t equalize for about a week. As uncomfortable as early signs of hypoxia are, I’m glad I experienced NASA’s altitude chamber. Its an extremely valuable tool for learning signs of hypoxia and the importance of avoiding it. Linda: The Experimental Aircraft Association hosts full weekend workshops around the country, offering courses relative to building an airplane, such as gas welding, sheet metal, fabric covering, composites and electrical/avionics. These workshops teach the skills necessary for constructing various types of amateur built aircraft, either from kits or plans, providing a place to learn and develop skills before starting a project and making some expensive blunders. We hadn’t taken any of their courses so when the EAA scheduled one in Houston earlier this month we signed up. With all the great choices offered it was hard to choose just one; we chose sheet metal basics. Mike: I had been scheduled to work that weekend and didn’t know if I could get the time off for the course which, coincidentally, was being taught at the Aviation Institute of Maintenance next to door to where I work. After a bit of schedule juggling it all worked out. The timing was good for me, as I was in the midst of acquiring yet another type rating, this time the Challenger 601. The Challenger’s systems are completely different from the Hawker aircraft I’ve been teaching in lately and my brain was crammed full of newly acquired knowledge of the electrical systems, hydraulics, flight control systems and all the things that make up that particular complex jet aircraft. On top of that I was still teaching in the Hawker 800XP so switching my brain between the two aircraft with very different systems was wearing me out mentally and physically. My check ride in the Challenger took place the day before the start of the sheet metal workshop, so with that behind me the workshop was a great way to do a mental dump and spool down while learning a new skill. We learned how to form wing ribs, how to do press rivets, pop rivets, back riveting, and dimpling while constructing a small wing section with a trim tab on it. The inspection hole on the bottom of the wing we backed with a doubler, with nut plates to hold the cover. We showed off our wing project at our EAA Chapter 12 meeting the next Tuesday night. When you have a close-knit group of folks doing something like this the atmosphere is jovial as fellow members describe their learning experience, compare rivets, and pass around the projects for examination. EAA workshops will be offered in Houston once a year, and anyone can take the courses; you don’t have to be a pilot or airplane builder. Linda: A couple of days after our workshop I spent an entire day at NASA for high altitude training. This training is part of what is required of a pilot in command of an aircraft capable of operating above Flight Level 250 (25,000 feet). The purpose is to give the pilot a thorough understanding of the physiological effects of altitude on the body, and to be able to recognize one’s own bodily reaction and symptoms of hypoxia. Experience is the best teacher and experiencing hypoxia in NASA’s altitude chamber offers a safe learning environment. I’ll share my hypoxic experience next week. Till then, blue skies. 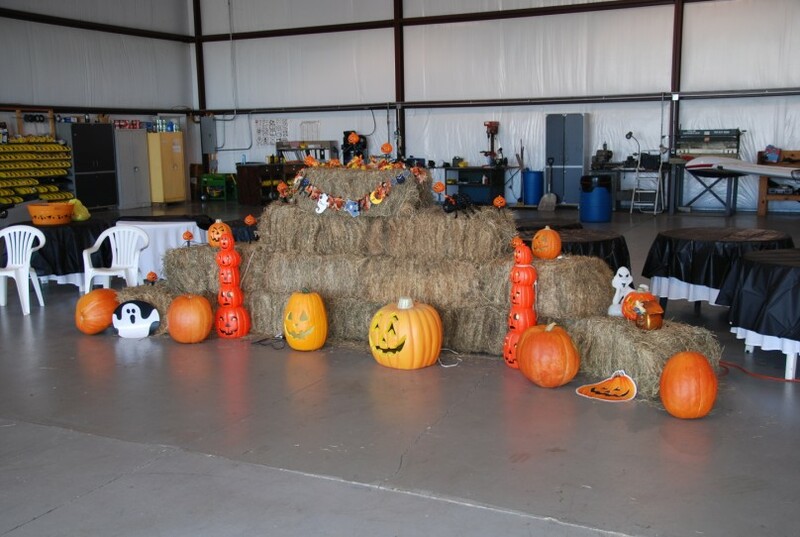 Linda: “How low do you want to go,” asked the young pilot as I climbed in the Cessna 150 at sunset, basketball-sized pumpkin in hand, preparing to take the final shot in the Tennessee Valley Punkin’ Chunkin’ contest. My goal: to be the one to hit the target, a port-a-potty set way out on the grass between two runways. We were far enough from persons and property to not be a hazard, so I replied, “as low as you want.” Holding the brakes, the pilot pushed the throttle full forward. Reaching the engine’s highest RPMs, he released the brakes for a short-field take-off. We lifted quickly, but stayed just barely above the ground. Veering slightly left to line up for the shot, we were nearly mowing the grass. Would I win the contest? I’d have the best shot, no doubt. Everyone else chunked from a few hundred feet up. Then again, I didn’t have a fancy pumpkin-launching contraption like Tom Martin did. The Canadian farmer and EVO F1 Rocket racer had plenty of time in the seat of a tractor to contemplate inventions. Tom Martin: When I heard there would be a pumpkin-dropping contest this year I wanted to participate. The way it was set up you could go for a ride in a Cessna 150 and launch the orange fruit out the passenger window. This would be fun but I really wanted to do it from my own aircraft, an F1 Rocket. 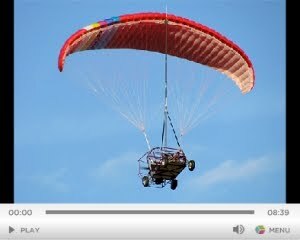 The problem is that the canopy cannot be opened in flight. I thought about this problem for many hours while harvesting this year’s crop of soybeans and corn and came up with an idea for a wing-mounted pumpkin launcher. 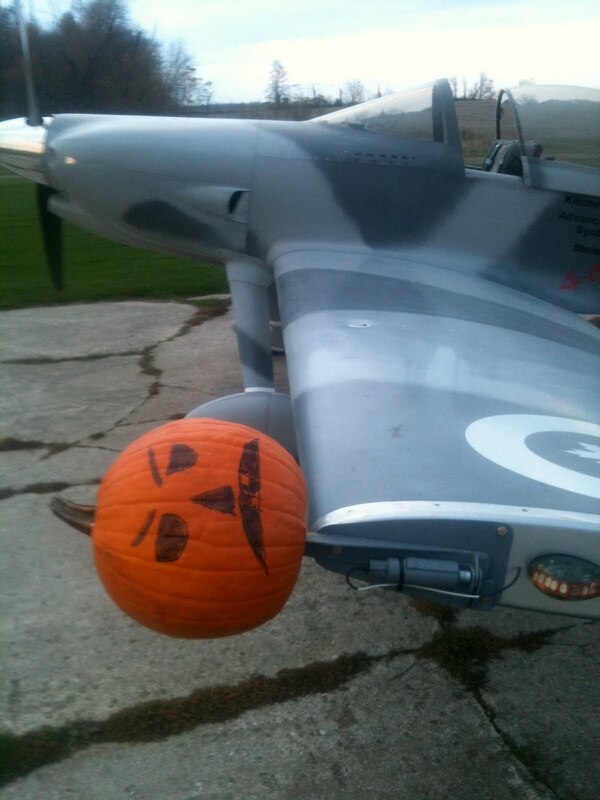 The EVO wing on this aircraft has a flat metal wing tip–a perfect place to mount my pumpkin spear. I fabricated an 18” spear with a pivot point at the wing tip. The spear was large enough to accommodate a pumpkin about the size of a volleyball. Aft of the pivot point I used an electric solenoid for the release mechanism. The solenoid had started its work life as the release mechanism for the rear hatchback on a ‘90s era Jeep. 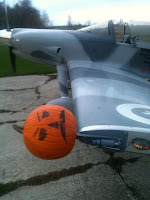 It was with some trepidation that I took off with a pumpkin sticking out from the far leading edge of my left wing tip. Limiting my speed to 120 knots I could feel no associated drag. This surprised me; perhaps it acts like that large bump that you see on the forward edge of the hull of ocean tankers. I think all the other racers in my class should install pumpkins on their leading edges. I made two drops; the first one was an abysmal failure. I let the missile go way too early and observers wondered if it even hit the airport. Armed with the shame of my premature pumpqulation I managed a much better drop the next time, salvaging my dignity. I look forward to next year’s competition. Linda: Tom still didn’t hit the can, giving me a chance to win. The pilot got me so close that had my arms been long enough I could have pushed that port-a-potty over. Through the open window I hurled the big orange bomb–Whoosh! Mike: Having had the best shot possible, she couldn’t believe she missed. Maybe over the winter Linda and Tom should both practice. Mike: The photo of a man hangs on the wall of a small office in a small building at Ellington Field. The first thing you notice is the broad smile. It dominates the picture of the man and the Cessna 150 he towers over. Long, dark locks, common in the 1970s, date the picture, but it’s the smile that radiates. Linda: Robert and Helene McCorvey have owned and operated Flying Tigers Flight School for about five years. Purchasing Fletcher Aviation at Hobby they continued operating out of that airport for more than three years before damage from Hurricane Ike caused them to relocate. About that time Cliff Hyde was ready to retire and sell his second-generation Cliff Hyde Flying Service at Ellington. The time was right for Cliff, and for Robert and Helene, combining the two legacy flight schools (and over 100 years of service) in the greater Houston area under the leadership of a very enthusiastic entrepreneur. Business has grown, adding training under contract for aviation programs at Lee College and Sterling High School, a Houston magnet school. Robert joined the Houston Aviation Alliance and was elected president in 2008. And whenever we have seen him he has always had that smile, and the willingness to drop what he’s doing to help someone else. Mike: Often I have walked into Flying Tigers and wandered into Robert’s office just to chat, always welcomed to a comfy sofa–the same sofa upon which he sat when chatting with Maybelle Fletcher from whom he bought his first flight school. Maybelle laughs, “Robert came in one day, sat on the sofa and asked me, ‘Do you think I’m crazy for wanting to own a flight school?’” Maybelle shot back, “That’s easy! Yes!” But Robert has loved airplanes and flying as long as I have; he started flying in 1974 and never stopped. Owning a flight school was always his dream, even when he was playing in a Beatles band, even when was working in his father’s sheet metal fabrication business which he eventually bought and later sold to his brother. We spoke of many things during our chats, one was about our faith in Jesus Christ, the center of why Robert is so enthusiastic about life. Linda: Thinking his asthma was acting up, and then suspecting pleurisy, Robert learned in September he had mesothelioma. In the remainder of his time here he ministered to those who came and sought to minister to him. The night before Thanksgiving Robert McCorvey moved to Heaven. His last audible words, “Thank you, Jesus,” remind me of the graceful surrender modeled by Pastor Jimmie Clemmons. As the huge crowd gathered to honor Robert, his three grown children stood tall in the Lord, firm in their faith, proclaiming the love of their dad, and the love of our Father. God was glorified at his memorial service, and if it’s possible, Robert’s smile is even bigger now. Mike: At the end of the service everyone walked outside Houston’s First Baptist Church to watch the Lone Star RV squadron fly overhead in formation, three passes, with smoke on. Their final pass, the “missing man,” honored the aviator whose life has enriched many. We didn’t lose Robert, we know exactly where he is; he hasn’t “gone west,” he’s moved to Heaven where he soars. And through his family his legacy and his dream, Flying Tigers, will continue. 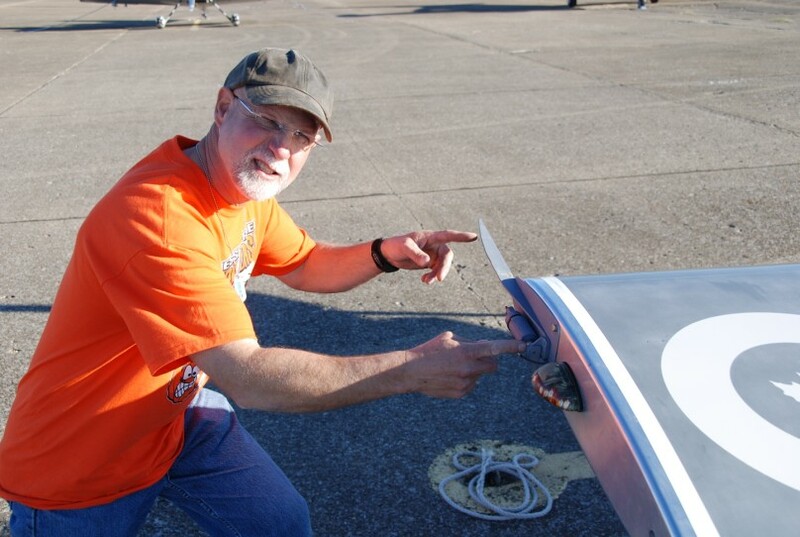 Linda: The Tennessee Valley Pumpkin Dash and Air Race at Courtland, Alabama coincided with our Cheetah’s annual inspection, grounding us for about a week. Since Mike was working that weekend I thought I might catch a ride with Reno Air Racer Ernie Sutter, who keeps his 300+ mph Lancair Legacy at the Conroe airport, but Ernie was leaving a few days early and had business along the way so Sport Air Racing League founder and Chairman, Mike Thompson, flew his RV-6 down from Taylor, Texas to pick me up. In return, I would handle the Internet broadcast of the race, live on Justin.tv. It would be the next best thing to racing, and on a more personal level, reminded me of my dad, who stopped racing automobiles when my mother said, “It’s either children or racing, but not both,” and opened up a public relations business, representing the United States Auto Club for many years. Several childhood summers were spent traveling from one car race to another, my daddy’s shadow. Now I would get a shot at the microphone. A day and a half notice wasn’t enough for Dad’s longtime friend, retired ESPN race broadcaster Gary Lee, to join me but it piqued his interest and I expect he’ll join us in the future. Chief Thompson and I planned to meet at the Anahuac airport and leave at 9 a.m., but due to starter problems we didn’t leave until 5 p.m. Taxiing up to the hangar in Courtland a few hours later, tired and hungry, race host, airline pilot and sport air racer Chris Murphy was a welcome sight with plenty of eats there waiting for us. The next day’s events began with an all-out speed dash straight down the runway. With FAA speed and altitude waivers granted retired veterinarian Tony Crawford clocked fastest time in his Questair Venture at 308.16 mph. The top eight speedsters exceeded 250 mph. Next came the 125.2 nautical mile race with 23 airplanes entered. At the pre-race briefing racers were instructed to pause in front of the camera while I said something about them and their airplane. Chief Thompson’s idea to broadcast was a big hit with racers’ spouses, children, grandchildren and other family members and friends watching. Pre- and post-race interviews brought insight from the racer’s perspective. The final event of the day was the “Punkin Chunkin” contest. Chris Murphy placed the target–a port-a-potty–way out in the grass between the two runways, far away from everything on the airport. Everyone grabbed pumpkins from a huge pile–one guy loaded his Navajo Chieftain with extra large pumpkins for carpet bombing–and one by one pumpkins smashed on the ground. Airline mechanic Bobby Bennett’s understanding of trajectory as an experienced skydiver gave him the closest drop but no one hit the target. After all the participants had taken their shots I asked if I could try. 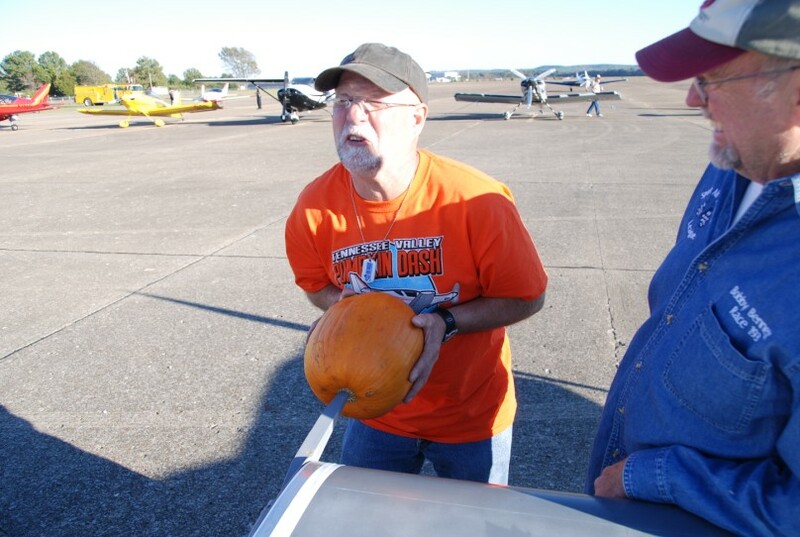 Someone shoved a pumpkin in my hands and ushered me to a waiting Cessna 150, a pilot ready to take me up for the shot. That story might appear in this space next week. Till then, blue skies. Mike: Returning from our Fall vacation last month, the same tailwinds we enjoyed on the way up to New England were headwinds on the way back, considerably reducing ground speed and thereby requiring more fuel stops. First stop after departing Pittsfield, Massachusetts came three and a half hours later in Morgantown, West Virginia, once we cleared a lot of mountain ranges along the route. The airport was quite busy, which we learned was due to a local college football game. The FBO fueled the plane, the airport restaurant fueled us, and we were airborne again. Linda: Often when we’re travelling during football season we end up at an airport in a town where an important game is going on. Usually it’s the college games which affect the general aviation ramps, filling up with aircraft of the many alumni who fly in. A fuel stop in Knoxville, Tennessee proved to be another stop like Morgantown. A football game was going full tilt when we contacted Knoxville Approach Control. It so happened it was my turn in the left seat on that leg. The approach controller vectored us around the University of Tennessee Neyland Stadium so we could get a good view, which, were I a football fan (I know, I’ll dodge the tomatoes) I’d have been thrilled about. “Grumman 958, how’d you like that view of the game,” he asked as we flew along the southeast edge of the stadium. The Volunteers were playing the Alabama Crimson Tide and we figured it must have been halftime, judging by the barrage of camera flashes we could see from above, and undoubtedly a capacity crowd in the 102,455-seat venue. My honest response to the controller probably set me apart from everyone else in town. “Well, I’m not much of a football fan, but I sure love flying!” His quick follow-up likely hid his real feelings, saying, “Well either way, it’s a great view,” before handing me off to the airport’s control tower. Mike: The airport ramp was packed; jets, turboprops and piston airplanes everywhere. “You here for the game,” was the presumptuous question posed more like a statement of fact until we shocked the people in the FBO saying, “No, just a fuel stop and overnight.” The FBO folks told us it was good we called ahead, that we were lucky to get the last hotel room in town. And fortunately, the hotel was right across the highway with a Ruby Tuesday’s next door. As we made our way out on the FBO ramp the next morning, Linda spotted a Cessna 310 with Isaiah 40:31 painted on its tail. She researched the registration and found this story: in 2003 at the age of 56, N137CM’s owner, Charlie Queen, suffered a massive stroke and spent many weeks in a hospital. His wife was told to find a nursing home for him. Linda spoke briefly by phone with Mr. Queen and there is more to his story, which we are eager to hear so we can share it here, but this miracle we know: that he can now walk again, and is putting his miracle to great use. Linda: Arriving at Ellington just as the sun was setting on Wings Over Houston air show, we carefully taxied past break-down crews to our parking spot, marking the end of our fall foliage tour. Linda: Autumn in New England. Lovely. Through the Green Mountains on our way to Weston, Vermont, we travelled country roads draped in old train trellises, past old houses mirrored by serene lakes, as fog finished its whisper to canoes waiting mostly on the shores and the water began to smile from ringlets of raindrops. Even with the apparent age of these places, splashes of fall color and a Maple Lane in every town sets the stage for great sight-seeing. Weston, the town we read was “like a Norman Rockwell painting” is home to the Vermont Country Store, a popular attraction for shoppers. Adorned with Autumn-ness its pumpkin-lined slate rock walkways accented by wood and iron benches, old wooden barrels, and dotted with mounds of bursting fall chrysanthemums lead to a welcoming porch with waiting rockers. Off to the side, a 1950’s Chevy pick-up and an old milk can. A bit touristy but a trip down memory lane in the candy department helped me get over it with rock candy, jawbreakers, and yardstick bubble gum. We stayed one night in Weston; there was more of Vermont to see. After lunch in Woodstock the next day, we roamed through an art gallery and a used bookstore, waiting for more flyable weather. As the clouds began to clear enough to make our next flight we shortened our time brief at one of many antiques stores in Quechee and hurried back to the airport in Lebanon, New Hampshire. Next stop: Stockbridge, Massachusetts (landing in nearby Pittsfield). It was my leg to fly on this “interesting” weather day. Light rain, but visibility good. Still, a large band of low clouds meant a longer flight to find clearance over the mountains. Since we don’t have de-icing equipment we would not fly in the clouds, as the temperatures in them were below freezing. Pittsfield’s airport was hiding behind a mountain range, but eventually we came upon it. Fortunately the swift wind was blowing straight down the runway. Mike: The friendly lineman at the FBO in Pittsfield drove the rental car onto the ramp to meet us, and helped secure the plane. Soon we were on our way to Stockbridge, just minutes away. Stockbridge boasts home of the Red Lion Inn, since 1773. A large and elegant historic hotel (with an operating bird-cage elevator), the Inn is decorated with thousands of antiques. Among the goodies in the room was a booklet with three short bedtime stories, a unique and charming touch. Norman Rockwell lived his last 25 years in Stockbridge. His studio was moved to a larger piece of property it shares with the museum which houses most of his original paintings and tear sheets of every Saturday Evening Post cover he created. He worked 12 hours a day, 7 days a week, including holidays, for most of his life. We spent most of a day at the museum that honors the beloved artist who captured on canvas daily life in America for many decades of the last century. Too soon, vacation was nearing an end. Crossing again over the Berkshires, Poconos, Catskills, Smokeys, the Appalachian, Adirondack, and Green Mountain ranges, bright hues of orange, red, and yellow covered the landscape like a soft knitted blanket. White church steeples in small towns bid a warm good-bye. The video camera got a lot of use. Mike: Following up on last week’s start on “What We Did on our Fall Vacation,” wrapping up the patriotic portion of the trip–Minuteman National Historic Park, Concord and Lexington, the spot where Paul Revere was captured and the bridge where someone fired “the shot heard ‘round the world”–we departed Bedford, in Boston’s busy airspace, winging our way to Lebanon, New Hampshire, the northern most point of our tour. The rolling terrain of the White Mountains lit up in fall color is beautiful when viewed at low altitude below a broken cloud deck. Initial decent point came in less than an hour; over a ridge the crossing runway came in to view before we spotted the one where we were cleared to land–behind yet another hill. Turning final around the hill the air was a bit bumpy as we settled onto the runway. The FBO manager greeted us with smile, keys to a rental car, and a bottle of New Hampshire maple syrup, saying, “it’s better than that stuff you get in Vermont–over there they paint their leaves.” On a roadmap he pointed out the many things we shouldn’t miss along the way. “Don’t miss the longest usable covered bridge in America,” he said. We checked it out, crossing the Connecticut River to Vermont and back to New Hampshire in minutes. Although it was practical back in the day to cover those old wooden bridges to keep them from collapsing under heavy winter snows, today we adore the nostalgic remnants of a romantic Currier & Ives era. Linda: Nestled amongst the rolling hills of the Connecticut River Valley, the Monadnock Region of southwest New Hampshire, sits a 100-acre organic farm with Bed & Breakfast, the Inn at Valley Farms. Innkeeper Jackie Caserta treated us to a gourmet breakfast that outdid Massachusetts’ famous Red Lion Inn, which we would later visit. She introduced us to “popovers”, using a recipe she has perfected, fed us the freshest, yellowiest eggs we’ve ever had, and a fancy concoction of pear with maple and some other tastiness. No wonder this inn was awarded 2010 Editor's Pick in Yankee Magazine's "Best of New England." Jackie insisted we visit the headquarters of the world-famous Burdick’s Chocolates, there in tiny, quaint Walpole. Dinner in Burdick’s dining room provided another gourmet experience: traditional French cuisine (Mike wouldn’t even consider trying the escargot), and a walk through the gift shop made it impossible to remain just a browser. People in these small New England farming communities treat visitors nicely. The old and rare bookshop in the Green Mountains in Vermont was a cozy place to meander. New England pot pies, pumpkin ice cream, and maple-flavored everything were found in abundance in every town. For several months we researched and planned our Fall Foliage Tour. One of the places that piqued our interest was the town of Weston, Vermont, described by a travel resource as, “like a Norman Rockwell painting.” We’ll have that and more next week. Till then, blue skies. Mike: After planning for more than a year, we took off in our Cheetah for a New England leaf-peeping tour. The rolling terrain dressed in beautiful fall splendor of Ash, Birch, and Maples draws many a foliage fan every year. Sojourning with the birds grants a great view of the countryside from Houston to Boston. Leaving the flatness of southeast Texas we marveled at God’s handiwork: the Berkshires, the Poconos, the Catskills, the Smokies, Appalachian, Adirondack, and Green Mountain ranges, each offering their beauty in turn. Winging our way northeast from a fuel stop in Chattanooga the landscape began to change from green and brown to shouts of yellows, oranges, and reds, becoming more brilliant as we crossed over West Virginia into Maryland. Cumberland, Maryland was our lunch stop (gusty winds made the landing “sporty”). An adorable little town, population about 20,000, their historic, shopping, and restaurant district downtown is quite impressive with its brick streets, flowerpot-lined sidewalks, busy shops, unique galleries, restaurants, and prominent buildings of interesting architecture. A little further north, West Point Military Academy came in to view along the Hudson River. I said something to Mike about trying a water landing, Sully-style. He’d already had his moment of imposter-glory when he re-created that famous scene in a simulator. I remember the grin as he told me he’d landed “within one block of Sully’s landing” – in the sim. Mike: Assisted by a speedy tailwind we sailed through New York and Boston’s airspace, flew over Walden Pond, made famous by Henry David Thoreau, and entered the traffic pattern at Bedford, Massachusetts. In nearby Concord we had reservations at the historic Colonial Inn, which proudly faces Monument Park, the centerpiece of Concord’s downtown. There stands a monument to the area’s Patriots who hoped for peace but had to fight when the British “Red Coats” attempted to take over the town April 19, 1775. It was in that spot the townspeople gathered and waited as the King’s soldiers marched from Boston to Lexington and soon to Concord. Many of the buildings, taverns, meetings houses and residences there at the time are still standing. It was in Lexington, just east of Concord, where the British opened fire on townspeople, killing eight, and injuring many more including Prince Estabrook, a black man who was a slave, and served in the town’s militia. Just a mile from Col. Barrett’s farm is the North Bridge which arches over the Concord River, where “the shot heard round the world” was fired. It was the first time Colonials fired on the British. The British Regulars tried to escape back to Boston but many died on what is now known as Battle Road. Our tours of Lexington and Concord, the first two battle places of the American Revolution seemed timely in today’s political climate. Minuteman Park Rangers were outstanding tour guides, and the multimedia presentation was a top-notch production. On April 19th each year these battles are re-enacted, lest we forget. The next town on our agenda was Walpole, New Hampshire, where we traversed New England’s longest covered bridge on our way to a bed & breakfast on a 100-acre organic farm. ‘Til next week, blue skies. Linda: Our recent visit with Benny Rusk netted many interesting chronicles of aviation, farming, friendship, and life. In the past three weeks we’ve shared a few of those, including some of the important history of the Liberty Municipal Airport. As we followed him down the hallway of his modest farm home “Mr. Benny” pointed out framed photos hanging on the walls. Some were of him in his boxing days when he was a heavy weight contender from 1946-1948. He fought the heavyweight champion contender, Roy Harris, of Cut-N-Shoot, at the 1958 Trinity Valley Exposition. The match ended in a draw. Aviation has been an enriching part of Benny’s life. Today, alongside his mile-long grass runway, which he says at one time was designated as the auxiliary airport for Liberty, sits the hangar that once housed his Piper Comanche, Cessna 310, and others over the years. While Earl Atkins is properly credited as the founder of the Liberty Municipal Airport, it didn’t happen without Benny Rusk. In him, we met a hard working humble man who speaks generously of the good in others. Looking forward to the recently announced plans for repairs and upgrades, approximately $1.6 million to be invested in our 54-year old airport, while Benny may not have realized then how important his little grass strip would become, he is one of the people who made it all possible. Today, when our area faces a crisis and roads are jammed or closed, help is able to come by air. When business people need to fly in to Liberty, they have a place to land and contribute to our economy. Benny’s passion and enthusiasm not only sparked so many friends and family members to earn a pilot license, but has become an integral part of the National Transportation System, a gift to the community that will outlast us all and will keep on giving in immeasurable ways. Linda: From pheasant hunting in Nebraska to land deals in Louisiana, aviation has been an enriching part of Benny’s life. We always say we meet the neatest people in aviation, or, as Benny puts it, “just a different class of people.” A trip to Mexico for a fly-in turned out to be one of those times. We’ll have more next week. Till then, blue skies. Linda: Continuing with personal insight on the Liberty Airport’s humble beginnings, here’s more from our very enjoyable conversation with Benny Rusk at his kitchen table. What began as a 42-acre piece of land, with skillful negotiation and planning and a great passion for aviation became today’s Liberty Municipal Airport. It was the 1950’s and rice farming ruled here in Liberty County. Earl Atkins came to Liberty to do aerial seeding and crop dusting for M&M Air Service, operating out of Roy House’s grass strip. Benny Rusk was a banker who owned 42 acres near Ames. Business was booming and Earl needed more space. If Benny could increase the size of his property Earl could move his operations there. According to “Mr. Benny,” negotiations with one neighbor added “another 12 or 14 acres.” Then he bought another 400’-500’ of frontage road from another neighbor making the property big enough for a landing strip. As soon as Benny and Earl got some hangars built Earl moved his operations to the present location of the Liberty Airport. That was 1956. Of the hangars built back then, only one remains– the one nearest the gate on the FM2830. The City of Liberty eventually took over ownership but Earl continued to manage the airport until he moved to the Valley. In 1984 the City acquired adjoining land to extend the runway to its present 3,800-foot length. Mike: Those who knew Earl Atkins say he was a top-notch pilot, an outstanding instructor, and savvy aviation businessman, so it’s no surprise Benny has lots of Earl stories, such as the way he handled an airplane while crop dusting. Rather than make sweeping turns at the end of each row, Earl would pull the nose up almost vertical, kick the rudder and the resulting hammerhead (an aerobatic maneuver that takes some skill) would have the plane nose down, picking up speed. He’d eased it back to level, in line with the next row. “He cut those turn times in half,” laughs Benny. But one time the control stick detached, coming out in Earl’s hand just after take-off. He dumped his 1800-lb. 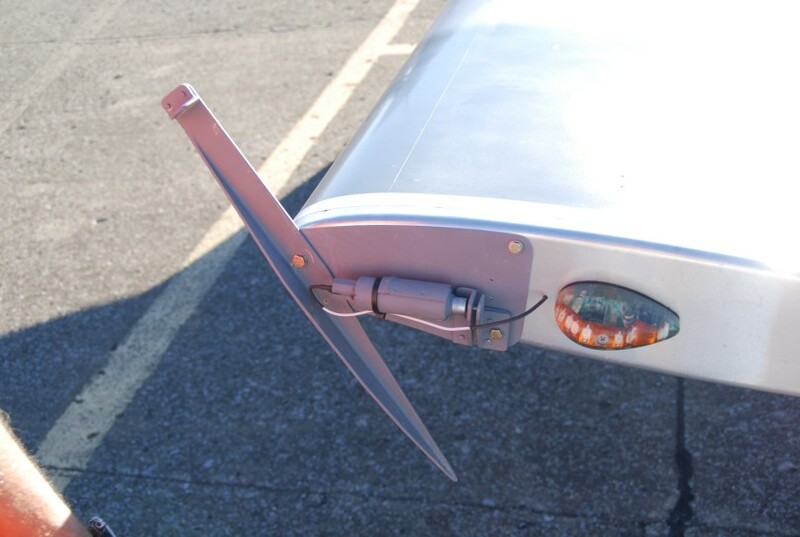 load, used the trim tab for pitch control and made power (thrust) adjustments to get the airplane down safely. Linda: Benny’s enthusiasm for aviation is contagious. After Earl taught him to fly, eleven of Benny’s family members eventually learned. Among them, his wife, Linda, presently a school teacher in Mont Belvieu, who earned her private pilot license; daughter Benetta, who has some great memories of her own to share; and nephews Mark and Craig McNair who both went on to become professional pilots. There’s more good stuff to come, so don’t miss next week’s issue. Till then, blue skies. In a press conference held last Wednesday at the Liberty Municipal Airport, City Manager Gary Broz provided details of the planned $1.6 million investment in the 54-year old airport. From its humble beginnings as Benny Rusk’s private property where Earl Atkins operated his crop dusting and other flying business, to its present condition, a 3800’ runway, self-serve Avgas, and a few old hangars, the airport has weathered some storms. Like some small towns, at times it has been out of favor with politicians of the day, and at other times it has been fortunate to have some of the best advocates money cannot buy. The airport was assured a bright future with the addition of Gary Broz, who said, “There is no use having an airport if you’re not really going to have an airport.” Gary’s 25-year long flight training journey gives him the passion greatly needed here; his experience as city manager in Brady, Texas working with airport manager Joe Mosier, and all the improvements made there are serving as a backbone to Gary’s understanding of the tremendous potential value an airport offers a community. The presently planned improvements include $725,000 in federal grant funds for what TXDOT calls Capital Improvement Projects (CIP) that have been in the works for more than three years, such as continued drainage work, resurfacing and rehabilitating the runway, and upgrading the lighting system. All these projects are very basic needs and important in the long run for Liberty Airport to be improved. With federal grant funds which come from airline ticket taxes and taxes on aviation fuel, insurance money reimbursing damage from Hurricane Ike, FEMA funds (also resulting from Hurricane Ike), and $450,000 from the Liberty Community Development Committee (from local sales tax), approximately $1.6 million will go in to the completion of several projects. In addition to the basic needs, plans include at least one building of 10 T-hangars, a pilot lounge, relocation of the self-serve fuel tank to the east side of the airport, a fuel truck, and additional parking lot area. The fuel truck may be used for Jet A fuel, since that option is not presently available in Liberty, but that decision will be made later. While it’s a good idea to have a fuel truck available at the airport in case of community emergencies, fuel contamination from mixing different types of fuel would pose a hazard to aircraft. Because the Texas Department of Transportation’s Aviation Division holds the purse strings for both FAA and State airport grant funding, one requirement to receiving the funds is to have a current airport layout plan on file with TXDOT. The layout plan is an extensive plan drawn up by a team of engineers and other airport development professionals and should be updated no less than every five years. The current cost of that plan is $80,000, of which Liberty will only pay 10%. And although the ground hasn’t even been broken for the T-hangars, Broz says they are 100% leased with a waiting list, making a second bank of T-hangars a good possibility. The city receives income through the sale of avgas, and the leasing of city-owned hangars and ground leases for privately owned hangars. Publicly owned airports such as Liberty’s may be managed either by a city employee as airport manager or privately by a Fixed Based Operator (FBO). The better facility an airport has to offer the greater interest there is by private business to locate there. Aviation businesses such as paint shops, mechanic services, upholstery shops, small plane manufacturers, parts manufactures, as well as flight schools, air ambulance, pipeline patrol, aerial photography, freight, and many other services are always looking for well maintained and managed facilities. Companies that use an airplane for business are also important customers. Most corporate aircraft are small, single engine propeller planes. Future plans also call for a professional airport manager and courtesy cars, economic development tools that will have area businesses rejoicing. Broz places a high value on having a smiling face there to greet visitors, to welcome them to Liberty, and knows the importance of that person being one from the aviation community who understands the unique needs and expectations of pilots and their passengers. The most recent study commissioned by TXDOT for airports in Texas indicates that the Liberty airport creates $219,000 annually in economic activity. With these investments, that number is sure to increase, moving the Liberty Municipal Airport closer to being the public asset it should be, one that serves its community. Linda: Time spent in the home of Benny and Linda Rusk netted more than a few interesting stories about life in these parts, and about aviation. For more on the history of what is now the Liberty Municipal Airport, we go to the source: its original owner. Mike: Banker, farmer, boxer, war veteran, and soon-to-be pilot, Benny Rusk’s arrival in Liberty turned out to be a pivotal time for aviation here. His flying lessons started in 1956 with Earl Atkins in a Luscombe rented from Houston TV man Ben Erskine for $3.50 an hour. They flew out of Roy House’s airstrip on Highway 90 behind where Terrell’s Auto Parts is now. After four hours of flight training Benny invested $2,900 in a 1949 Cessna 170 he purchased at Ellington Field’s aero club. A year later he sold it for what he paid for it, never having to put money into it except to buy a new tire. An economics major, he was no slouch on making good deals; over time he owned a Cessna 180, Comanche 250, and a Comanche 400, a 215-mph airplane that carries six hours of fuel. With that kind of speed, Benny learned what other business people know: “an airplane puts one more day on the week.” His last airplanes were a twin-engine Cessna 310 and a single-engine Cessna 210. He remembers when National Pipe & Tube came to Liberty, the big reception and the politicians taking the executives up and down the river to show them the town. “We had one police officer and no crime,” Benny recalls fondly, “we had a town where rice and cows put more bricks here than oil ever did.” He also knew that aviation was vital to a community’s health and the area needed an airport. Benny owned 42 acres where the Liberty Airport now sits. We’ll pick up next week with how he grew it into what we have today. Linda: World record holder CarolAnn Garratt was back in Houston recently sharing her adventures in around-the-world flying and a subject near and dear to her heart, raising awareness and funds for research for Amyotrophic Lateral Sclerosis, or ALS – Lou Gehrig’s Disease. CarolAnn and her record-breaking partner, 2006 Air Race Classic champion, Carol Foy, departed Orlando International westbound on December 2, 2008 and flew around the earth in CarolAnn’s Mooney to shatter the 20-year record set in a Bonanza. For publicity, the pilots appeared at AirVenture in Oshkosh and sat in a Mooney for 24 hours. They set hard-and-fast rules about the flight, including weather minimums and what circumstances would dictate deviation to an alternate airport for landing. The westbound route would take advantage of the Easterly Trade Winds, which occur in most of the world. They would sleep in two-hour shifts and plan the route to maximize the stops in U.S. territory. The flying pilot was always on oxygen at night, and a full instrument approach was flown for every night landing. Flight leg-times ranged from 16-23 hours. With an FAA waiver allowing 15% over gross weight the Mooney was equipped with extra fuel tanks for a total capacity of 195 gallons (1,170 lbs) of avgas. Tools and fuel tanks crammed in the cockpit left precious little room for much else; CarolAnn toted her toothbrush in her flightsuit pocket. Mike: One of the reasons we like flying our Cheetah out of Ellington Field is the variety of aircraft we see on a regular basis. Recently there has been a lot of clamoring about the contrails left by a NASA high altitude test plane. Numbers 926 and 928, the 49-year-old WB-57F Canberras, are operated by NASA for experiments and high altitude astronaut training. They are the only two B-57s still flying today, and both are based at Johnson Space Center facilities at Ellington. We often see them in NASA’s hangar, on the ramp, or doing takeoff and landing practice at the field. I don’t know what experiments they were performing last week, however, I do know they are up there all the time. The vast amount of moisture left in the air by Tropical Storm Hermine could account for the more noticeable contrails. NASA also operates the ER-2, another high altitude aircraft. The ER-2 has been deployed from Dryden Aircraft Operations Facility in Palmdale, California to Ellington Field when requested by NOAA, the National Oceanographic and Atmospheric Administration, to monitor, map and photograph the oil spill in the Gulf. The ER-2 is a variant of the famous U-2 spy plane, one of which was piloted by Francis Gary Powers who was shot down over Russia in 1960. Powers was later returned to the U.S. in exchange for a Russian spy we arrested. Another of the flying tubes we see on a regular basis is a Boeing 727 used for zero-gravity training. When this airplane is pitched nose up at a 45-degree angle above the horizon followed by a steady push over to a nose down position in a parabolic arc with just the right measure of force, temporary weightlessness ensues and its occupants “float” for up to 25 seconds at a time. Nausea often being the result, these planes are sometimes called the “Vomit Comet.” A previous aircraft used in this role, a Boeing KC-135, NASA number 930 now sits silently on a pedestal like a sentry at the entrance to Ellington after it performed more than 58,000 of these arcs. Linda: The astronauts have T-38s, training jets, and I’d guess there are about 20 or so kept at Ellington. The fast jets fly 1,500 feet above the ground in a standard traffic pattern altitude when flying in to Ellington. At most airports light airplanes (the ones with propellers) would be flying a traffic pattern of 1,000 feet, but unique to Ellington, they enter the pattern at 600 feet. That has made for some fun departures when I’ve taken off with Texas Air National Guard’s F-16s or the NASA T-38s crossing overhead. There is never a dull moment at Ellington, a well-managed airport inhabited by real aviation enthusiasts who promote it well. Again this year Bill Roach, the top dog at Wings Over Houston, donated four tickets to the Liberty-Dayton Chamber for the annual auction. The Thunderbirds are back this year, along with Sean D. Tucker, Debby Rihn-Harvey, and a host of other great airshow performers. If you’ve never been to the show, this is your year. You can get up close to some incredible machines, many of historical significance. If you have been before, you know what a great show it is – and you don’t want to miss it: October 23-24. www.WingsOverHouston.com. Linda: A world traveling pilot friend came upon a copy of Sheila Scott’s autobiography, “I Must Fly” while somewhere in Europe and sent it to me. I found I had many things in common with the late British aviatrix, like her competitive spirit, love of all things aviation, and appreciating friendly people. Shelia Scott broke over 100 aviation records from 1965-1971, including three around-the-world flights in a Piper Comanche. Building up to that skill and stamina, Sheila began flying in a de Havilland Gipsy Moth, a fabric covered bi-wing airplane used as military trainers in the 1930’s. She also flew a similar model, the Tiger Moth. Being the cool chick pilot she was, she nicknamed her first airplane “Myth” because it means a female moth. Over the years Sheila dubbed her planes “Myth,” “Myth Too,” “Sun Myth Pip,” or “Mythre.” The word, “Myth” was always written somewhere on any plane she flew, even if only in lipstick, and even if it wasn’t a Moth. She had some close calls, and sometimes was surprised her airplane was still flying. Her good fortune she attributed to the name, “Myth.” Okay, so that part isn’t much like me, but I love her competitive spirit. Funny thing about the Moth though is that last year another good friend, Katie, gave me the autobiography of Bette Bach Fineman. Bette is a long-time friend of Katie and her family and Katie had her sign the book to me at last year’s annual Antique Aircraft Association fly-in in Blakesburg, Iowa. Bette’s name “Bach” comes from her long time marriage to writer Richard Bach. She’s no stranger to aviation. Bette wrote about flying a Gipsy Moth. She loved that airplane, and the way she wrote made me wish I had one, or at least the chance to fly one. That desire grew after reading Sheila Scott’s book. When Katie’s step-mom, Sharon, told me last year that if I’d come to Blakesburg in 2010 I might have a good chance of seeing, and maybe even getting a ride in a Gipsy Moth or Tiger Moth, we reserved that date on our calendar right away. The months rolled by and soon it was September again, time for the Antique Aircraft fly-in. I had “Myth” on my mind. About a week before the fly-in the timing on another commitment changed, making Mike unable to go to Blakesburg. Disappointed, I headed to the office on the Friday morning that we would have been flying to Blakesburg, stopping for gas at John Hebert’s gas station there in front of Thrif-Tee Foods. On the middle pump I saw a huge orange-ish butterfly with some interesting markings. It didn’t seem to be bothered by my pumping gas, and didn’t move even when I took its picture. I called Mike, suggesting if he needed gas that he go to the middle pump and check out the butterfly with a 10-inch wingspan. Shortly thereafter, Mike called, saying, “I don’t know how to tell you this, but that’s not a butterfly.” It sure looked like a butterfly to me, I thought. I made all sorts of noise at that point. God really has a sense of humor. How often does one see a Tiger Moth around here? I had never seen one before that. Mike: Old acquaintances greeted one another, catching up on the latest flying and airplane building adventures as airplanes filled the ramp and cars packed the parking lot at West Houston Airport where a large audience gathered to hear first-hand from one of the heroes of an incredible event that captured the world’s attention for several days in April, 1970. Gene Kranz was the NASA Flight Director of Apollo 13, and our Guest of Honor and speaker at EAA Chapter 12’s 55th birthday celebration. The hamburger lunch, cooked and served by fellow chapter members, was generously provided by folks from the Austin Planetarium, who had on display a large portable planetarium – probably a good topic for another week in this space. Dessert, a couple of sheet cakes, was polished off in no time. Gene opened with a pitch to see if anyone wanted a couple cans of Poly Brush and some aircraft wheel pants he’d been trying to find a home for and he felt that someone in the crowd just might need them. The Poly Brush, used in the coating process of fabric covered wings, wound up in the hands of Lance Borden and will be used as he recovers his 1929 Inland Sport biplane, a plane flown in races years ago by several pilots, including Marty Bowman when she won third place in the 1931women’s National Air Derby, the same cross-country race Linda races, now called Air Race Classic. Lance and Linda have an idea cooking that involves a future air race and that Inland Sport. Gene’s book, “Failure is Not an Option,” was the subject of his talk: of getting the crew of the crippled Apollo 13 spacecraft home alive. He had great praises for all those young 20- and 30-somethings he worked with at NASA to make all this happen, singling out several in the process to give the crowd a little background. At 38, Gene was the oldest person in the Flight Control room. Linda: Gene is such a personable guy and his presentation, complete with historic slides, photos in a Power Point that were taken during the time of crisis, was smooth but not canned. I’m not sure how he did it, but he kept us all on the edges of our respective seats with suspense and emotion, even though we already know the story. Somehow, it’s just different hearing it firsthand. Gene spoke of leadership and teamwork, and never said, “I,” but focused on the team and other team members. He took us step by agonizing step through the intense days of the Apollo 13 mission, the problems, the solutions, the hopes and fears, and the total commitment of the entire team: that failure was not an option. I only noticed his cadence slowed once by extraneous distraction; being the father and grandfather of an all female crew, when the two-year old daughter of our friends, Bob Watkins and his wife, Aileen, a 747 pilot, strutted proudly back to her seat after a potty break, pigtails bobbing with every step, Gene was taken by the cuteness and stopped his speech for a grandfatherly chuckle and smile. In a break from history there was the Gene Kranz of today, with all that is behind him, a reminder that his story has purpose for future generations. A photo snapped afterward of Katalin on “Grandpa Gene’s” lap caught the essence of their instant bond. AirVenture is not only the largest annual convention of anything, anywhere, it’s one that embodies the spirit of aviation. Homebuilt and light sport, aerobatic and high performance planes, vintage and current warbirds, and even spacecraft are being showcased this very moment through August 1st, for a full week of pure “aviator heaven.” Concerts by bands such as Chicago, and Asleep at the Wheel, daytime and night time air shows, fireworks, a salute to Veterans that spans the entire event, and live auctions you can join in online through www.auctions.com, are just some of the other special features. For the Young Eagles Auction, Ford Motor Company created an aviation-themed car: the one-of-a-kind 2011 SR-71 “Blackbird” Mustang. In 2008, the Mustang AV8R (with hints of the F-22 “Raptor”) delivered a record auction contribution of $500,000. In 2009, the AV-X10 “Dearborn Doll” auctioned was crafted in honor of WWII aircraft. This year’s Mustang is the first collaboration of former U.S. Air Force flight instructor Carroll Shelby and long-time P-51 pilot Jack Roush. The SR-71 “Blackbird” jet first took flight in 1964, the year Ford’s Mustang was introduced. Shelby and Roush helped design, engineer, and produce the SR-71 “Blackbird” Mustang, which includes their embroidered signatures in the seats. Young Eagles and other EAA programs are designed to inspire youngsters to become engineers, aviators, astronauts, scientists, and innovators–the aviation pioneers of tomorrow. Introduced in July 1992, Young Eagles has already flown more than 1.5 million young people at no charge, making it the largest youth aviation education program in history, thanks to EAA. Linda: Tom Poberezny is EAA’s president and AirVenture chairman; his dad, Paul is the guy who started it all, way up there in cheeseland back in 1953. It now draws over a million people each year. Thousands camp under the wings of their airplanes or on the lake shore nearby where a couple hundred floatplanes are moored. The theater in the woods shows new and old movies, including this year, “Fly About” and “Breaking Through the Clouds,” and all those people flock like gooney birds to the daily seminars offered by the best known aviation experts in the world. There are seminars on how to use a new product to its fullest potential, and builder workshops; presentations on the latest news and events affecting aviation, the introduction of new aircraft, and jaw-dropping fly-bys. Check the schedule online at www.AirVenture.org–it’s like a world’s fair of aviation and at its core is the spirit that every person attending can sense. A million people like us, visiting and sharing experiences and enjoying the atmosphere, with the only real anxiety possibly being how nearly impossible it is to see everything here in a week. “Another reason I like doing Grace Flights,” Charlie adds, “is that it lets me control my giving. I know that 100% is going directly to the people who need it.” Grace Flight accepts donations to fund facilities at Hobby Airport, and the minimal paid staff. Overhead is low, thanks to many volunteers. Linda: Charlie’s got a heart for people. With his success he could easily be sitting around saying, “look at me, look what I’ve done,” but instead, he’s out there helping others. “On one flight we had some pretty rough weather conditions. It was lousy weather all the way. I think my passenger actually found it exciting, but I was concerned. Heading to Mineral Wells the wind was really picking up. There’s no control tower there, but the people on the ground said over the Unicom frequency that the wind was favoring landing on the taxiway.” The two runway options were both beyond the crosswind landing limits of the airplane. “About a mile out, I banked into the wind as hard as I could, with full opposite rudder, and began my final descent to the taxiway. About 300’ above the ground the wind suddenly stopped. In front of the crowd that had gathered to see if this pilot could make a landing in that wind, it was probably my best landing ever.” An exciting flight, no doubt; one that enabled one young man to have needed chemo treatment. Grace Flight is something Charlie doesn’t take lightly. For those who don’t fly, or don’t own an airplane, he offers this suggestion: “You don’t have to fly to help. Ground volunteers are needed too. The economy is down, people with clerical or administrative skills, ground transportation, a cheerful attitude and a caring smile are needed. You don’t need any special skills for that.” To volunteer, call 888-500-0433, or www.GraceFlight.org. Tell ‘em Charlie sent you. Mike: 13-year old Charlie sat in the back seat of the old white Cessna 172. It was a short flight, maybe thirty minutes, but it changed his life. “I got to have me one of these,” would stay on his mind for nearly forty years. Then on July 4, 2006, Dayton resident Charlie Sisk, owner of Sisk Rifles, bought his first airplane, a 1957 Cessna 182. He began primary flight training at the Cleveland airport until his first solo flight, then finished at Georgetown, and took his private pilot check ride at Brownwood airport. Charlie talked close friend, Aaron Baker, owner of Cannon Safe, into learning to fly. When Aaron earned his private pilot license he knew he didn’t want to be limited to flying under Visual Flight Rules only, so the two discussed instrument training so they wouldn’t be grounded on rainy days, giving them the freedom and mobility both businessmen needed. Aaron made Charlie an offer he couldn’t refuse: he’d pay for the course if Charlie would take it first, and then help him through it. November 2007 Charlie began an accelerating instrument training course and earned his instrument rating in just ten days. Linda: Charlie Sisk doesn’t let any grass grow under his feet. He’s down-to-earth, logical, and real smart. He’s got an uncanny understanding of human behavior and he “gets it” about life and how to treat others. If something isn’t worth pursuing, he knows when to walk away. His personality sets the tone for his book, “Selecting and Ordering a Custom Hunting Rifle,” which is really a lot about life in general, and very entertaining reading. He relies heavily on his airplane for business, philanthropy, and an occasional pleasure trip, so if he wasn’t going to let his abilities limit him, he sure wasn’t going to let the airplane limit him either; he needed more instruments and an IFR certified GPS to use on bad weather days. In a sweet deal, he traded a custom rifle to Aaron, who traded a gun safe to someone else for a Garmin 430W, a really good IFR GPS that can get a pilot down pretty close to the runway when the clouds and visibility are low. The new GPS, along with a new autopilot, meant more possible flying days for Charlie. Mike: Charlie Sisk is one of those rare individuals who understands that what’s good for business is good for life, and vice-versa. That same drive he has for superior customer service shows up in his philanthropic endeavors as well. We’ll write more on those endeavors next week. Meanwhile, check out his website: www.siskguns.com.